Recently I had a failure on a 1 TB Seagate HDD having it only about 1600 total hours in use, not the usual failure starting with 1 or 2 bad sectors and latter becoming a lot of bad sectors, this was diferent the HDD sudenly became very slow to the point to be unusable. I was runing wimlib-imagex to transform an *.esd to *.wim when this happend so it involved many writes to HDD, then I rebooted the PC but it wasn't able to run Windows anymore. I had to put an spare HDD and boot from it confirming the PC was capable to boot and run Windows, then shut off the PC and put the damaged disk as secondary disk booting again this time very slow but fine, ran Aida64 and on storage/smart all was acceptable but on storage/ata saw the HDD buffer was not visible anymore (it was 64 MB before), it seamed to me the disk board had fail, so I started inmidiatly to transfer prioritary info to the good disk getting an average transfer speed of 3.5 MB/s, so this took me 4 days to do it. Latter downloaded Seagate tools for HDD and ran diagnostics from Windows and Dos, it failed to pass Smart and Short Drive Self Test (on Win & Dos), tryed other things but all was too slow so stoped it. Cheked warranty and they said it is Out of Warranty (Build date is 2015-05-23). 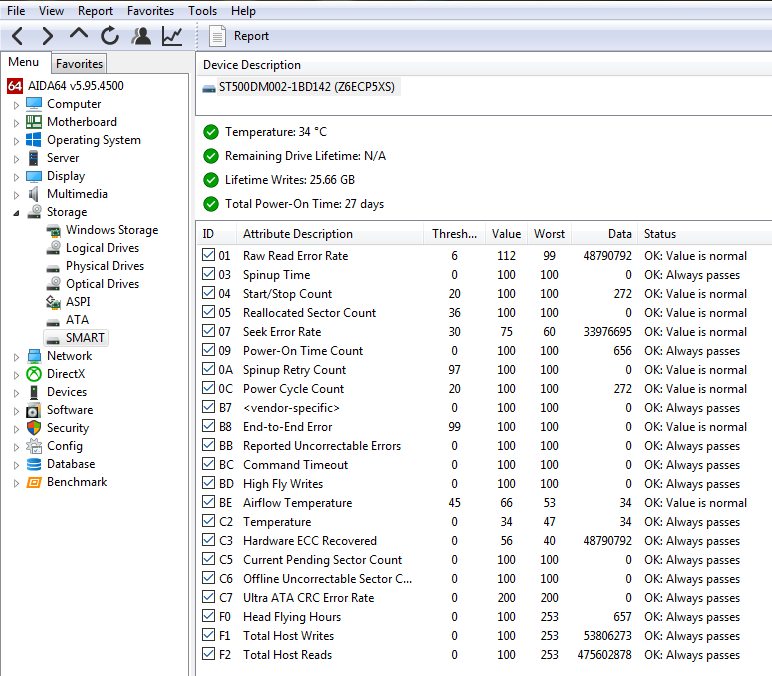 I am using now my spare HDD until I buy a new one, latter updated Aida64 to last version and on storage/smart there is a new line on top part called Lifetime writes, it was 1.4 TB when first saw it, I didn't pair too much attention to it, thinking it was for SSD's life, and it was a crazy reading in my case (having a HDD), but today it is 902.48 GB (after doing some WinPE buids), so it is reading it from somewhere, then I remember long time ago Sony put rootkits on CD's to not let copy them. I start thinking Seagate is puting now an embeded program to measure HDD writes (Lifetime writes) and when you exceeded the limit allowed, the high speed transfer is blocked, but give you a very limited transfer speed just to recover your info. 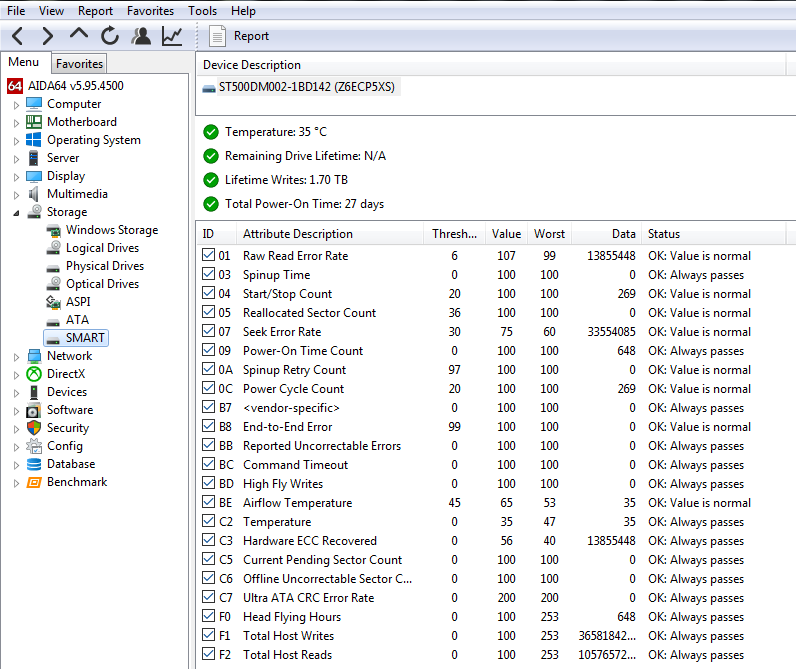 I have cheked older Seagate HDD's (512 bytes/sector) still working well, made before AF (4K/sector) and there is no reading in that item (Lifetime writes: N/A). If confirmed, this discovery would be one heck of a xmas present..
Hey guys , really, you can take your tin hat foil off when you are here on reboot.pro, it is (relatively) safe in here. The whole thing started - I believe- with SSD's, and it is entirely possible that it has been extended to hard disks. Your drive failed, I am sorry for this , but it happens all the time, to lots of people around the world and there is no evidence of any conspiracy. Cumulative writes during my HDD life: So this is Total Host Writes x 512 bytes each = 1892648061 x 512 = 969035807232 bytes = 902.48 Gb for the picture in first post, OK numbers make sence then. Then acording with this the reading has to increasse during HDD life as we write more info to it. But the point is I have seen oposite the reading is getting smaller not bigger. Just to run some more tests about this I formated Boot (0) and Windows Partition (1) and reinstalled OS,leaving Documents partition (4) untouched and make some pictures: 1 - Yesterday, Just after installing OS (7x64) and 2 - Today, after installing more programs, browser and antivirus and been in Internet all day. 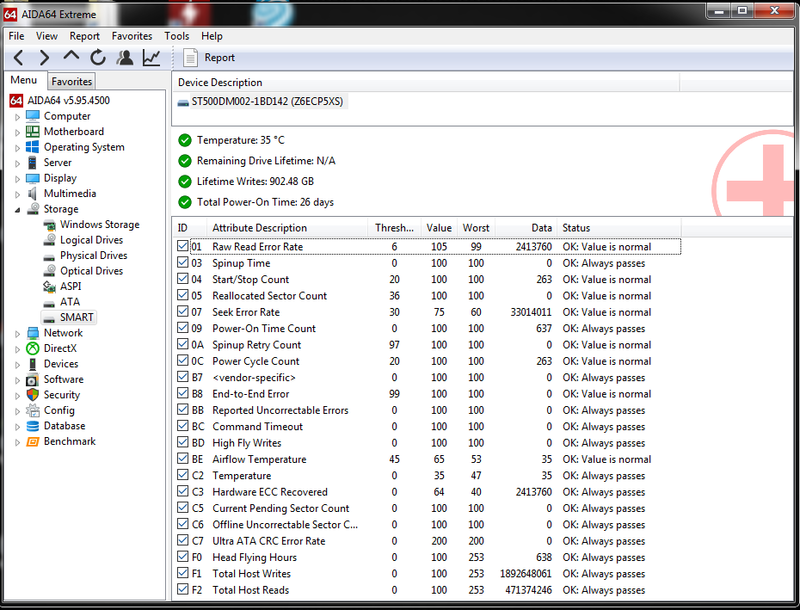 Numbers do not make sence, the more I add info to HDD the lower the Lifetime writes reading. So do we believe in SMART or not? which make a lot of sense, those are worth keeping an eye on, 5, 187, 188, 197, 198, still they are meaningful on a large pool of disk drives and not necessarily on each single disk drive.